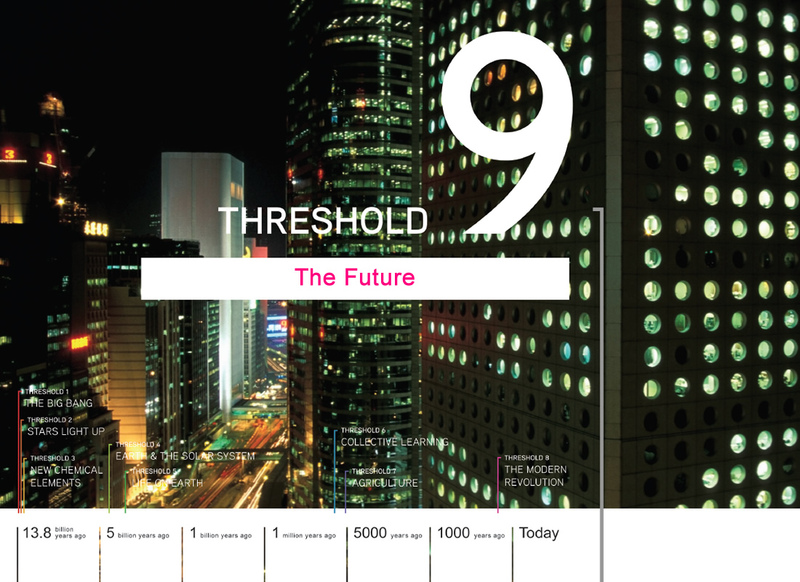 One of the exciting challenges of teaching the Big History course (BHP) is Threshold 9: The Future. However, in preparing to teach “The Future,” educators are faced with this stark reality: How do you teach something that isn’t written? And how do you explain something that hasn’t occurred? History teachers are driven by facts and look for evidence—or what Bob Bain refers to as “residue”—to explain the events of the past. By examining this residue, we can begin to understand the events of the past as well as our world today. When teaching Threshold 9, though, we no longer have the benefit of this residue—it doesn’t yet exist. This may seem like a challenge not worth taking. The reality is that students will never be tested on the future. However, this is where true learning occurs and the magic happens. This is one of the most important ways Big History differentiates itself from other history courses. It’s at this point in the course that students’ creativity and imaginations drive their learning. Let go! One of the hardest aspects of my first year teaching Big History was becoming the lead learner in the classroom and accepting the fact that I was not going to know everything. I had to communicate with the students that I would be facilitating many of the lessons, but that I would also be learning alongside them. Accepting this truth, embracing it instead of being scared of it, was when I truly felt like a Big History teacher. It was this approach that helped me teach Threshold 9. Have fun with it! Allow your students to explore something that piques their interest and allows their imaginations to run wild as they become truly divergent thinkers. Build upon what you’ve already taught. By this time in the year, students should be familiar with the concept of claim testing. Rather than telling the students they will be predicting the future, tell them they’ll be making a claim about the future based on logic, intuition, and current evidence. 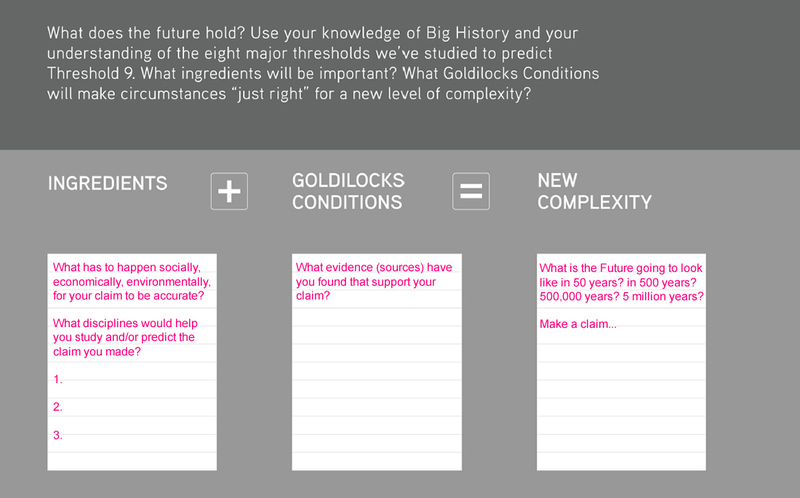 Also, because authority of the claim-maker is a theme throughout the course, students should be encouraged to ask the question, “What would be the best discipline (and who would be the best individual), to help me answer the questions I have, or support the claims I am making?” Students can get frustrated with the overwhelming scale inherent in thinking about the future. If this happens with your students, I recommended giving them some guidance. Ask them to make a claim about the future with scale as a factor. “What will the future look like in 50 years, 500 years, 500,000 years, and 5 million years?” A claim about how the Earth might look 50 years from now will be much different from a claim about what the Universe or even Solar System might look like 500,000 years from now. Here, they can use trends and global patterns to make predictions for the near future. By having the students focus on the first 50 years, you’ll enable them to feel more connected to thinking about what lies ahead, and they’ll be better able to frame the problem and perhaps propose solutions to solve it, which is the ultimate goal. Then, you can unleash their creativity. Once students understand the scale, allow them to think about the next 5 million years. Here the possibilities are endless. No one can accurately predict the future. However, we can spot trends and see patterns. Seeing these patterns helps students make predictions based on logic and current evidence. Will students even know what potential problems might exist? The Global Issues and the Millennium Project websites are two great resources that can help students with this research. Thinking and learning about the future presents a unique opportunity for students to apply the full complement of skills that were fostered over the course of working with BHP’s rich content and meaningful and authentic materials. While no one knows what the future holds, taking an active role in the thought process to begin to conceptualize it provides a powerful and dynamic learning experience for all students.